I don't think there's any question that on a red car, with red rims and spokes , white tires look terrific. -Same with a green car, or pretty much any color, for that matter. -Black cars feel a little different, though. -And a black car with stained and varnished spokes and felloes add yet another wrinkle. Now, I'm not talking about whether stained and varnished wheels are authentic or correct; I'm just talking about what looks pleasing to the eye. So, I figured I'd do a little Photoshop retouching and post the photos and take a poll of which kind of tires (black, white-wall, or entirely white) look best. Your opinions, ladies and gentlemen? I vote for the white walls, middle picture. I say the first picture. Varnished wheels and black wall tires. Of course I am partial for obvious reasons! I�ve noticed that some Ts can wear black walls better than others. For instance a Roadster with red wire wheels looks better with white walls. But your car with natural wood wheels looks better with black walls to me. Black wood wheels may look good with whites or blacks. The lighter colored wheels are accented by black tires and the dark wheels with white walls. IMHO. Inclined to like the whitewalls ,if you can find some. Of the three choices, I think the white sidewalls look best with that combination. It sure does depend on the color of the car and the wheels what would look most appealing. To me, brass cars look best with gray (or white) tires. That's how they came from the assembly plants, so they look "right" to me. Take your pick. A nice set of newly zinc plated rims helps too. I vote for the black tires! Yes but the white wall tires are period. 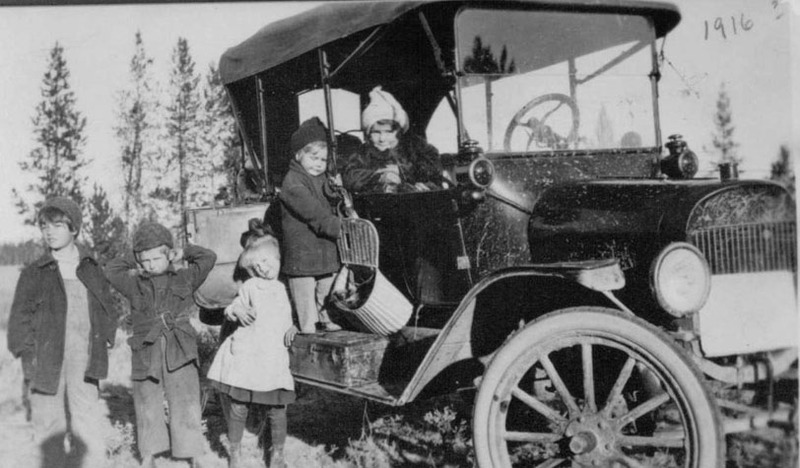 Because of cost, some early tires only had a cap of carbonized rubber, the black, leaving the rest of the tire gray or white side wall. When the cost came down the whole tire was black. Number 3. It's not too late to paint the wheels. 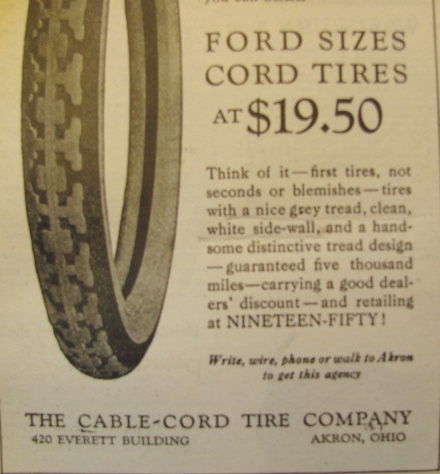 I wouldn't say white was more economical, just look at the price of tires back then, it was just the cost of adding carbon was more. They had learned that adding carbon to the rubber added life to the tires. Think these Cable-Cord tires are the best, grey tread, and white side walls! Good looking. The black was a cap volconizeed to the white tire carcass. All whites but one can cheat and run tread? Bud. 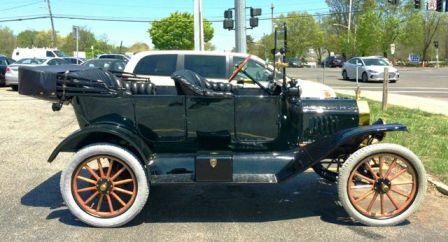 I don't think Ford ever put a white wall tire on a Model T and they look just terrible. I really think they were used so at night something was not all black and white circles were going down the road so you didn't run into them sideways in the dark. They look awful and take away from the wheels and make the tires look like a "toupee". stained spokes & white walls. On that car? All black, all white would be my second choice, an whitewalls 3rd. 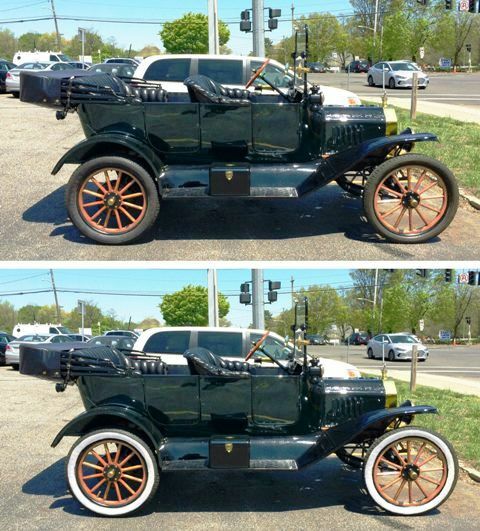 There probably no way of knowing whether these tires are the original tires from the factory, but they do show "whitewalls" on a Model T that was less than 1 year old. Also, what color are these wheels? Dirty black? Varnished? Repainted by the owner in a color other than black? Also interesting hood and radiator. Wayne, the wheels look to be the same colour as the underside of the fenders, so I'd go with dirty black. White walls I think look better on early brass cars. That is my opinion as put them on my 13 when I restored it back in the 80s. No longer availlable and not correct but neither are black. 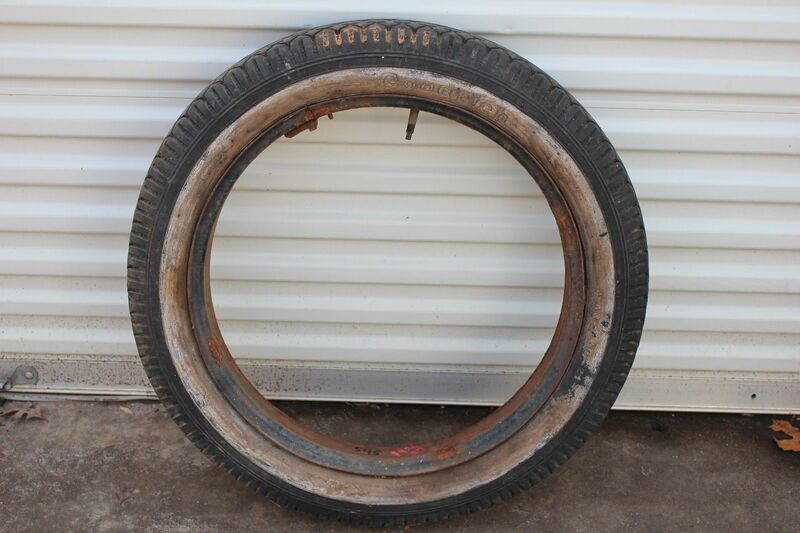 Dan Treace post was interesting and reminded me of a tire we found in a old garage back in the late 50s. The sidewall was white (gray?) and the tread area was red.An early brass car would look great with this setup. Wish I remember who the manufacturer was. white tires with black wheels in my opinion. ...but I like black tires too. It's too bad they can't make them red. Now that would be something. There were factory-new parts which, right from the get-go, were intended for regular replacement. How people replaced them and the parts they used are component with the historical record. -These items include tires, band linings, brake shoes, spark plugs and so on. 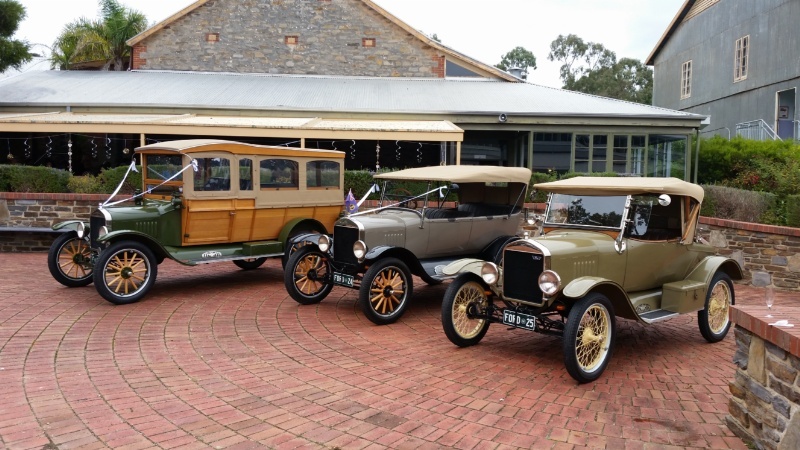 -Most Brass-Era automobiles were designed from the start with the intent of being, to a significant extent, owner-maintained, or owner's chauffeur-maintained�and all these cars required a lot of maintenance and tinkering. 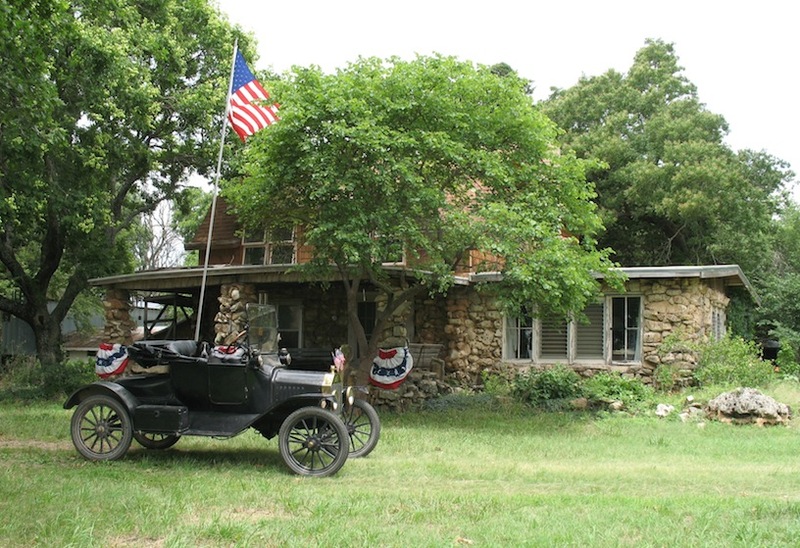 -In the case of Ford's Model T, which was designed to be kept in running order by a farmer wielding a pocketknife (and the American farmer was Henry's favorite demographic), this is especially true. 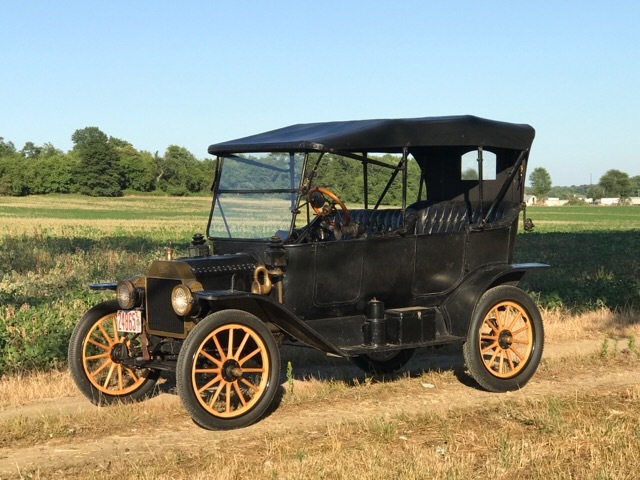 Because the car was the most-produced vehicle of its day, an aftermarket industry of non-factory, Model T parts manufacturers burst into being and the catalogs of these companies are now collector items. -I think this very widespread capitalistic endeavor should be considered a significant component of the history of Ford's Flivver. -The photographic record shows the car equipped with ahoogah horns, fat-man steering wheels, robe-rails, crystal vases (for Heaven's sake! ), rear-view mirrors, Hassler shock absorbers, accordion running-board racks and toolboxes, and yes�unpainted wood-spoke wheels and white-wall tires! Would this kind of stuff get past the eye of an AACA judge? 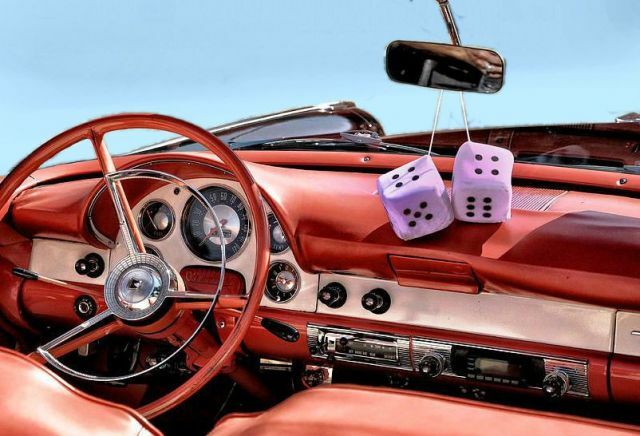 -Nah, but then, neither would fuzzy dice, curb-feeler springs, retractable "Necker" steering-wheel knobs, or a half-empty pack of Luckies on the dashboard of a '57 Chevy. -But you know what? -Such things belong there because they tell part of the story of the people who owned these cars. -And when I go to museums, I do see those accessories in abundance. As a related aside, the parts-network of Ford dealerships routinely replaced worn out major components (like rear axle/differential assembles) with recognizably later-model parts when owners would bring their cars in for such repairs. -As these were genuine Ford parts installed by authorized Ford dealers, what then would be the status of historical legitimacy and accuracy in such cases? -No good? 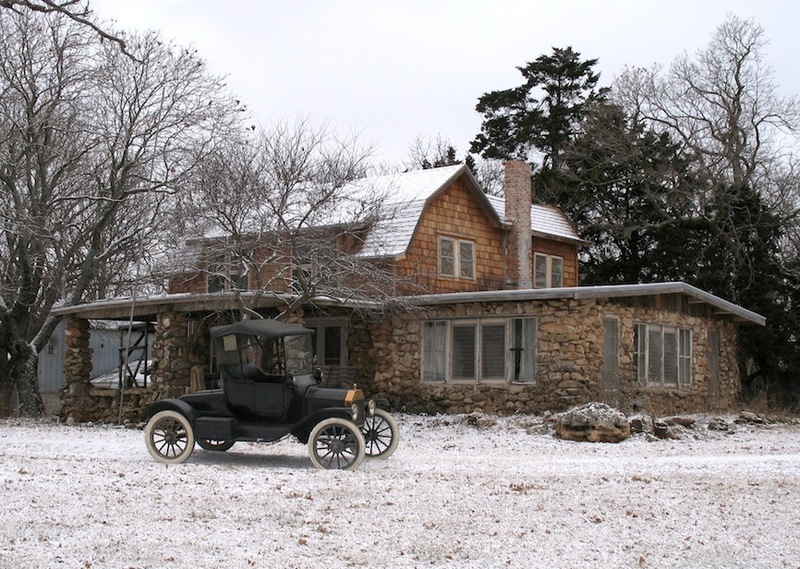 -Okay, what if the present owner could produce the original Ford receipt that documented such replacement? Good question. A look at the parts book will show that a lot of parts that were newly current at the time of the book are listed for 09-27. It was expected that the old part would be replaced with the latest version. 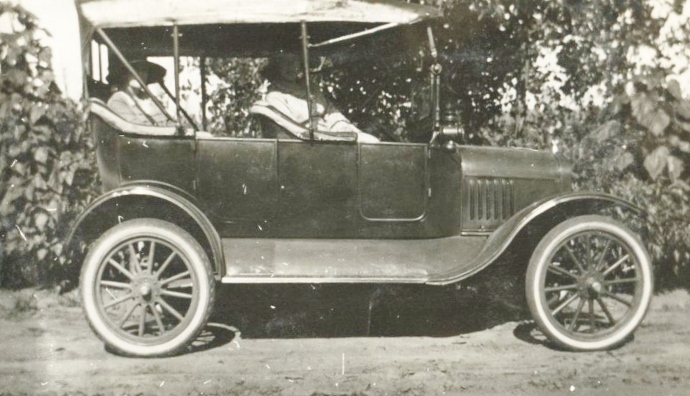 White sidewalls or all white tires with black spokes on brass era cars. I agree with Marty. Black tires on early brass cars just get you by as our choices in the modern world are limited.. My opinion.